Many of our first-time customers walk into our store looking for high thread count sheets. If only it were that simple, our job would be much easier! So, we figured that we would try to lay everything out for whomever may be interested. Linen “linens” feature, well, actual linen – which is a textile made from the fibers of the flax plant, Linum Usitatissimum. Linen has traditionally been considered the crème de la crème of textiles; for ages it was the clear choice of royalty, and its use can be traced back to ancient Egypt. In fact, when the tomb of the Pharaoh Ramses II was discovered in 1881, the linen wrappings covering him were in a state of perfect preservation, despite that they were more than 3000 years old. In modern times, cotton has surpassed linen in popularity, as cotton requires less effort to grow and manufacture well, is less prone to wrinkles, and feels softer and smoother at first touch – a versatile middle ground between pure linen and slippery silk. But those who have slept on linen sheets do know the benefits. Linen is highly absorbent and is a good conductor of heat, and as such it stays cool and fresh to the touch under almost any condition. Linen also resists dirt and stains, has no lint at all, and can be dry cleaned, machine washed, or steamed. It gets softer over time. Linen is also very strong, in fact it’s probably the strongest vegetable fiber known. It is stronger than wool, nylon, rayon, and almost three times as strong as cotton – in the middle ages it was even used to make shields. Like cotton, linen can be woven in different manners that create different textures, and perfecting sheet quality depends on perfecting harvest and manufacture techniques. More popular in Europe today than in the United States, it is not uncommon for our customers to inquire about linen sheets after sleeping on them for the first time at a European hotel. Whenever you hear the phrase “thread count,” generally it is referring to cotton sheets. So, you ask, the higher the thread count, the better, right? Not really. Contrary to popular belief, the quality of a sheet is at best loosely related to its thread count; a fine quality 200 thread count sheet will often feel much more luxurious than most 1,000 thread count sheets. When push comes to shove, sheet quality and feel is most directly related to: where and how cotton is grown; how that cotton is woven; and the length and thickness of each fiber. Different finishing techniques can also be employed to accomplish a desired result. 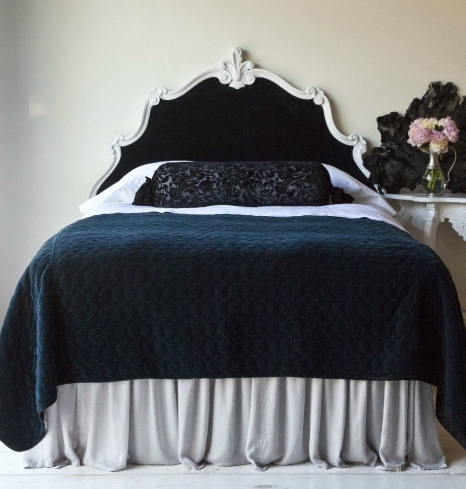 The most common finishes include: sateen, which pushes as many continuous threads as possible to the sheet surface in attempts to emulate the smooth, lustrous qualities of satin; percale, which utilizes a traditional basket weave in order to emulate the strength and breathability of pure linen; and jacquard, a strong and resilient finish that allows for the creation of woven patterns by individually arranging the warp (lengthwise) threads. Now, once you know how a sheet has been woven, how can you judge the quality of a cotton sheet? It starts with the cotton. Egyptian cotton is widely regarded as the finest cotton in the world, and sheets that are woven from Egyptian cotton tend to be extra soft, supple, and smooth – with two major caveats. For one, a sheet only needs to consist of just 2% Egyptian cotton for it to be advertised as an Egyptian cotton sheet. For two, not all Egyptian cotton is equal. Along the hot, dry desert of the Sahara, the Nile has created an oasis that enjoys extraordinary weather conditions; the two extremes combine to create the perfect storm, ideal for producing the world’s best cotton – referred to as Giza cotton. All Giza cotton is assigned a number, the smaller the better as smaller numbers correspond with longer staples and stronger, finer threads. This allows for better continuity from thread to thread, and it significantly reduces the chances that yarns will break and fabrics will pill. The best varieties of Giza cotton include Giza 45, Giza 70, Giza 87 and Giza 88 cotton; each of these cottons boast staples which are longer than 33 millimeters, and are recognized as indisputably the best cotton in the world. Giza 45 cotton in particular is grown exclusively in a small region called Kafir S’AD, responsible for only 0.4% of Egypt’s overall cotton production. Traditionally so fine that it could only be used in the manufacture of men’s dress shirts, Sferra has recently launched a line of Giza 45 bedding, resulting from two years of research and development. Giza 86, Giza 89, and Giza 90 cottons also boast high quality, but are not definitively better than Pima cotton, grown in the Southwestern United States and accounting for about 5% of annual American cotton production. Egyptian cotton grown outside of Giza does not offer particularly special quality. Of course, it is not all about the type of cotton. The manner by which cotton is harvested affects quality; if cotton is harvested carefully, and by hand, defoliants and other chemicals normally used in mechanical harvesting can be avoided. And even where cotton remains pure, cotton bolls can still become polluted with other fibers. It is the expertise applied to the manufacturing process – involving careful hands-on oversight often in conjunction with cutting edge technology – which allows manufacturers of fine linens to remove residual contaminants from the yarn spun, and to ensure proper results. Lastly, all else equal, thread count is not a bad thing. But, there are techniques that low-end manufacturers use to artificially inflate thread count. And, particularly where long staple cotton is utilized, high thread counts are unnecessary. A thread count in the 150-250 range is often sufficient to meet most people’s needs. Anything more adds strength to the cotton while resulting in a softer, silkier feel – but it also results in a heavier sheet, which is not always desirable. While the linens industry has traditionally been dominated by cotton and linen, suitable bedding can be made from almost any material. 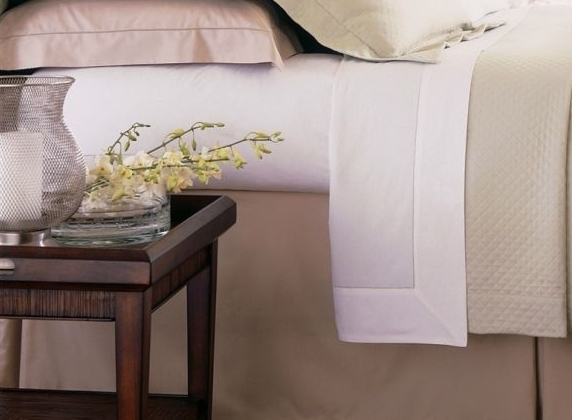 For discriminating consumers looking for a more unique bedding solution, there is a variety of options – bamboo, flannel, velvet, and amongst other options, you can’t forget silk and satin. Contrary to media portrayals, many people are not fans of silk sheets, and satin sheets. They may feel luxurious, but they are also slippery and boast additional imperfections; for example silk is a very thin material and satin is not very breathable. Luckily these advantages can be overcome as a result of modern research, development and creativity. Select bedding collections from SDH, Bella Notte and Peacock Alley for example, employ silk mixed with cotton, linen, and more to help mask the material’s imperfections. 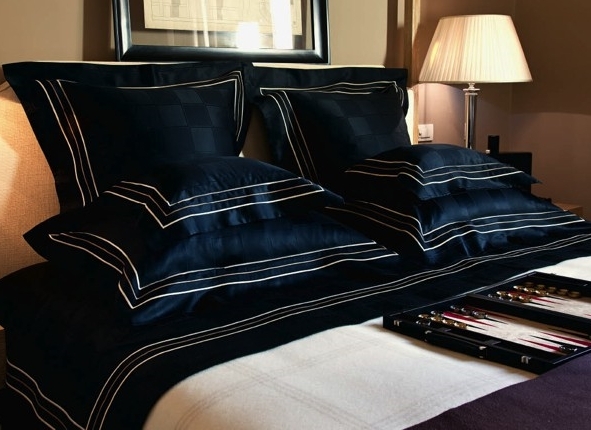 SDH’s Torino Stripe, for example, employs a nearly 50/50 silk and linen mix, where a silky, satin-esque surface contrasts both tactically and visually with wide stripes consisting of a soft, linen-esque surface; the silk adds a touch of luxury while the linen extends added strength, breathability, and grip. The most popular “new age” sheets that we sell at The Linen Tree are courtesy of SDH’s Legna line of bedding. The sheets are woven from 100% Italian wood pulp. They tend to be an easy sell after the first touch, as they feel about as soft and silky as any sheet not woven from silk or satin. They are also respectably cool and comfortable, and are as easy to care for as cotton sheets. 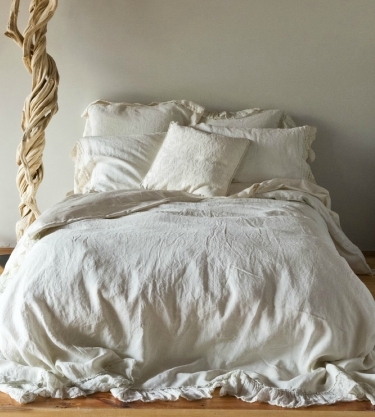 A favorite amongst our customers, SDH Legna bedding, made from wood pulp, seamlessly blends the soft and silky nature of, well, silk with the familiar ease of cotton. The final decision, what to buy? Ultimately, there is no “best” sheet, there is only the best sheet for you. 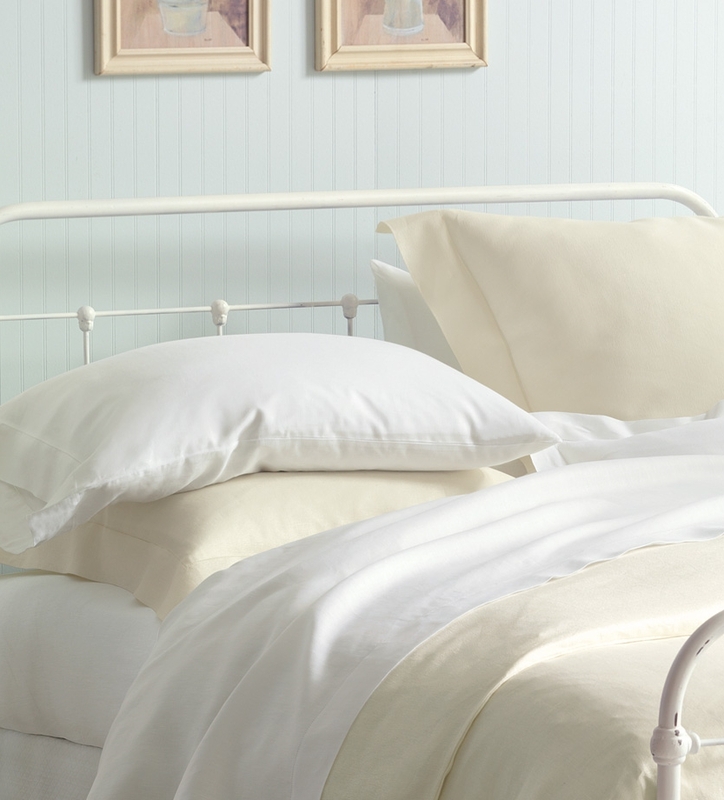 Read all you want about sheets, it is important to feel before you buy. We encourage anyone to swing by our store and sample the many swatches we have on our floor. Not local? Request swatches here – when possible we ship swatches free of charge as a courtesy to our customers. This entry was posted on Thursday, July 14th, 2011 at 6:25 pm	and is filed under Official Updates. You can follow any responses to this entry through the RSS 2.0 feed. You can leave a response, or trackback from your own site.